I would argue that very few passages in Scripture have been more abused over the centuries than Romans 13:1-7. It has been used to justify both allegiance to wicked governments and armed revolt against wicked governments. It has been twisted, perverted, and misunderstood since the time of Constantine. 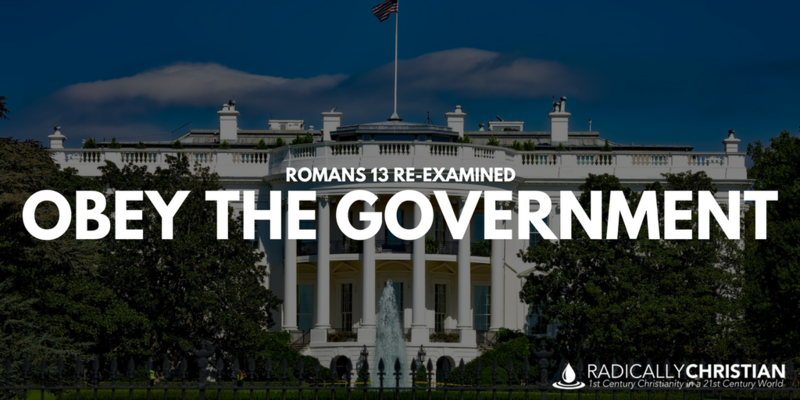 As a part of our re-examined series, it’s time we take another look at Romans 13:1-7. Around A.D. 56 the apostle Paul wrote this letter to a group of Christians living in the ancient city of Rome. Roman Christians had recently seen a new emperor rise to power, Nero Claudius Caesar. His ascension to the throne was probably orchestrated by his mother, Agrippina, who likely murdered her husband, Claudius Caesar. Just eight years after this letter was written, a fire broke out in Rome. To deflect accusations that he had started the fire in order to make room for palace expansion, Nero blamed the Christians. Christians were horribly persecuted under his leadership, “Some were condemned to be dressed in animal skins and torn apart by dogs, while others were burned to death in nighttime pyres that provided light for the emperor’s garden parties” (history.com). So we must keep in mind, this is the government about which Paul is speaking when he says the government is, “an avenger who carries out God’s wrath on the wrongdoer” (Romans 13:4). This is the governing authority to whom Christians were told to submit. Romans 13 must be understood in the context of Romans 12. Too often, Christians read and attempt to interpret chapter 13 in isolation. That is a huge mistake. Take just a few moments to read Romans 12:9-21. Paul tells Christians how they are to live their lives in light of God’s mercy. The overwhelming message of Romans 12 is that Christians are supposed to be people of peace. Even if they are persecuted, even if they are mistreated, even if they are cursed, Christians must be people of peace. They are told to be “be patient in tribulation” (vs. 12). They are told to bless their persecutors (vs. 14). They are told to, “Repay no one evil for evil” (vs. 17). They are told to feed and give drink to their enemies (vs. 20). Christians are told vengeance belongs to the Lord and they should “NEVER” take part in avenging themselves. Do we understand that this is our calling? This is how we present our bodies to God as a living sacrifice (Romans 12:1). As soon as Paul tells Christians not to take part in avenging themselves, he says there is “an avenger who carries out God’s wrath on the wrongdoer” (Romans 13:4). God’s avenger may be the most unlikely creature on earth, the Roman governing authorities. In spite of Rome’s wickedness and evil, Paul said they actually serve a God-ordained purpose. And because they serve a God-ordained purpose, Christians should be subject to their authority (Romans 13:1). I’m not sure if this came as a shock to first-century Christians, but it is actually nothing new to those who are familiar with the Old Testament. The empires of Egypt, Assyria, Babylon, and Persia were all incredibly wicked, but they were also used by God to carry out His divine purpose. They were not God’s people. God did not command or condone their wickedness, but He allowed their wickedness to serve His purposes. God was doing the same with the Roman Empire. Indeed, God does the same with every nation of mankind. We must remember, this passage wasn’t a charter to Caesar about how to run his government or what constituted a legitimate government. This passage was written to Christians, whose true citizenship was not to Rome but to heaven. The application is spelled out clearly: Christians living in Rome were to pay their taxes and not resist the government’s authority, even if they were killed for their submission. The application for modern Christians isn’t too much different than it was in the first century. Our citizenship is heavenly, not earthly. We are still called to be peacemakers. We are still called to love our enemies by giving them food and drink. We are still called to overcome evil with good. We are still called to submit and pay our taxes, even if doing so kills us. There is no room in Romans 12-13 for armed revolution. This is one reason it surprises me when I hear American Christians saying they need weapons to defend themselves against the potential tyranny of their own government. Brothers and sisters, the ability to violently revolt against government overreach may have been the American founding fathers’ intention for their people, but it wasn’t Jesus’ intention for His people. Our calling, like the calling of our first-century brethren, is to take up our cross and leave vengeance to God. If we are to be martyrs, then our deaths will be avenged, but they will be avenged by God and not by us. Brothers and sisters, “Live peaceably with all” (Romans 12:18).